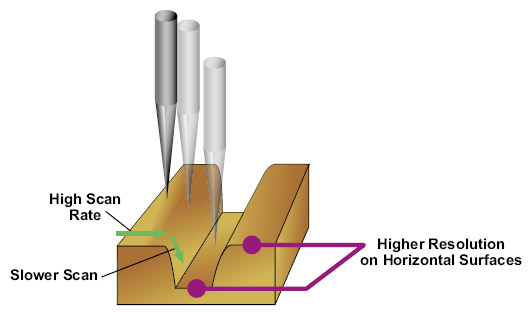 Deep Trench (DT) Mode is an AFM mode developed speciﬁcally for the repeatable measurement of deep semiconductor trench structures for 90 nm and below. It is an adaptive scan method in which data is only collected when user-speciﬁed system state conditions are met. This means that the tip is “allowed” to move only in certain servo states. 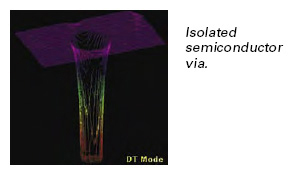 DT Mode “steps” the tip along the sample surface collecting data points only when “good” scan criteria are met. This permits feature-dependent scan optimization in which the concentration of data points is highest on the features of interest and low elsewhere, resulting in improved measurement precision.